The workshop of Eco Project (10/28 18:00-) at meeting room C, 25F, Boissonade Tower, Ichigaya Campus, Hosei Univ. 1. Report on environmental measurement of waterfront area of SE Asia (Thailand) by Deguchi lab. The workshop of Regeneration Project (10/27 19:00-21:30) at main meeting room, 7F, '80 Building, Ichigaya Campus, Hosei Univ. Theme: "European and American Waterfronts"
The 2nd workshop of Local Management project (10/15 15:00-) at meeting room B, 25F, Boissonade Tower, Ichigaya Campus, Hosei Univ. Theme: "Software of Waterfront Development-from the viewpoint of local management" by Naoshi Kawabata, Director of K Planners, Chiiki Kenkyu-jo Co., Ltd.
summary: The main point of this seminar will be waterfront development, aiming to realize affluence for each region in this era of low growth. The discussions will be given from the viewpoints of participation of inhabitants, management of local municipalities, through nationwide and worldwide case studies. The 1st workshop of Local management project (9/29, 19:00-22:30) at meeting room C, 25F, Boissonade Tower, Ichigaya Campus, Hosei Univ. summary: Town building based on ship transportation with low environmental load will be considered through the history of usages of water transportation in Edo and Tokyo. As a case study, "town building based on bicycles, trams and ships" will be introduced, which proposed replacement of transportation measure for newspaper factory construction along Sumida River. International Symposium by Laboratory of Regional Design with Ecology, Graduate School of Hosei Univ. (9/27 13:00-18:00) at school room 302 of '62 Building, Ichigaya Campus, Hosei Univ. 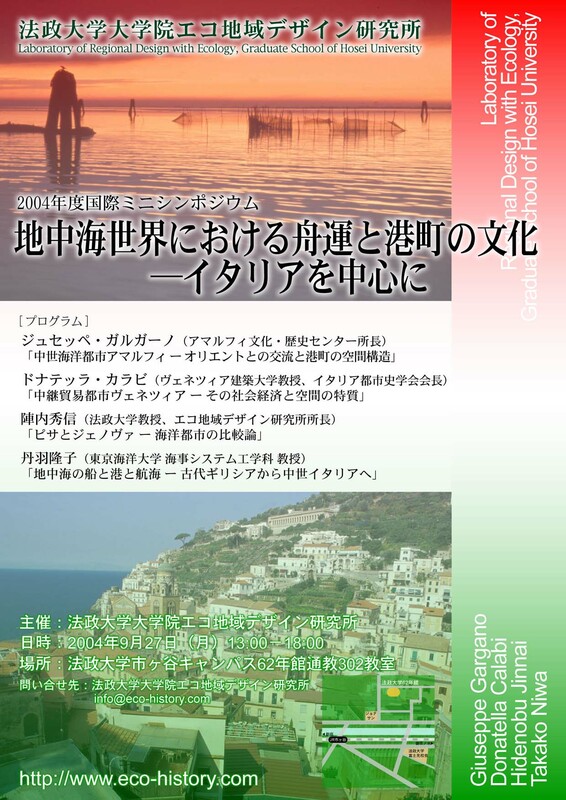 Theme: "Cultures of Ship Transportation and Port Towns in Italy and other Mediterranean Cities"
The 1st workshop of Regeneration Project (7/26, 18:00-21:00) at main meeting room of '80 Building, Ichigaya Campus, Hosei Univ. *The general meeting of Eco Project will be held from 17:00 in the same room and followed by the workshop. The 2nd workshop of History Project (7/20, 17:00-19:30) at meeting room D, 19F, Boissonade Tower, Ichigaya Campus, Hosei Univ. The 1st workshop of Eco Project 3 (hydrology and geography section) co-hosted by Research Group on Geography of Water Environment in Association of Japanese Geographers, and Study Group on Regional Environmental Science (7/14, 17:00-19:00) at meeting room A, 26F, Boissonade Tower of Ichigaya Campus, Hosei Univ. The 1st workshop of History Project (6/30 17:00-19:30) at main meeting room of '80 Building, Ichigaya Campus, Hosei Univ.